Journal of Minimally Invasive Surgical Sciences - Adhesions after Laparoscopic Ovarian Drilling in the Treatment of Women with Polycystic Ovary Syndrome: Should it be a Concern? Adhesions after Laparoscopic Ovarian Drilling in the Treatment of Women with Polycystic Ovary Syndrome: Should it be a Concern? To Cite: Api M. Adhesions after Laparoscopic Ovarian Drilling in the Treatment of Women with Polycystic Ovary Syndrome: Should it be a Concern?, J Minim Invasive Surg Sci. 2014 ; 3(1):e10729. Context: In order to restore ovulation, puncturing ovaries with a needle powered by electricity, under laparoscopic observation, in women with anovulatory infertility with polycystic ovarian syndrome is called laparoscopic ovarian drilling (LOD). Although peri-adnexial adhesion after the surgery is inevitable, there is lack of evidence regarding the clinical significance. The objective of the present study is to review the available literature in order to determine the rate of periadnexial adhesions following LOD, and to assess the effect of these adhesions on pregnancy rates. Evidence Acquisition: Electronic search of MEDLINE and EMBASE for English-language and non-English-language articles from 1984 to 2012 and manual search of bibliographies from identified articles were evaluated. Sixteen articles were found to be eligible to obtain main outcome measures. Post-operative adhesion rates were reported to be 0-100% (mean 35.5%, 95%CI: 30.8-40.4) while pregnancy rates after the procedure in these articles were 35-87% (mean 64.3% 95%CI: 58.2-70.7) of the cases. Results: There were no correlation between the adhesion rates and pregnancy rates (Spearman's rho=.055, P=.858). None of the preventive measures during or after the procedure were found to be effective in reducing the rate of post-operative adhesions, thereby increasing the pregnancy rates. The incidence of peri-adnexial adhesions after LOD might not be associated with adverse reproductive outcomes. Conclusions: Until more effective, safer and non-invasive treatments become available, LOD is a relatively safe and effective second-line procedure in anovulatory infertile women with PCOS resistant to clomiphene citrate. Polycystic ovary syndrome (PCOS) is one of the most common endocrinopathies, affecting 5% to 10% of the women in their reproductive ages. The first invasive approach to treat PCOS was performed by ovarian wedge resection described by Stein and Leventhal in the early 1935 (1). Until medical treatment became available, surgical therapy was commenced successfully (2). However, the procedure was often associated with the development of peri-adnexal adhesions; negating the beneficial effects of surgery (3, 4). Advances in laparoscopic techniques have resulted in a resurgence of interest in surgical induction of ovulation. In 1984, Gjonnaess created 8 to 15 craters by using a unipolar electrode, 2 to 4 mm deep in the capsule of each ovary. Ovulation was restored in 92% of the patients with a pregnancy rate of 80% (5). The laparoscopic procedure is a less invasive modification of ovarian wedge resection, and is known as laparoscopic ovarian drilling (LOD). In the consensus meeting of the Thessaloniki ESHRE/ASRM-Sponsored PCOS Workshop Group, laparoscopic ovarian surgery is reported to be an alternative to gonadotrophin therapy for CC-resistant anovulatory women with PCOS (Consensus Workshop Group 2008). Therefore, surgery can still be a reasonable option for women with PCOS who fail to conceive after losing weight and trying the first-line fertility medicines. Nevertheless, several drawbacks prevent LOD from being considered as a secondary approach to the treatment of clomiphene citrate (CC) resistant women with PCOS. Those concerns are the risk inherent to any laparoscopic surgical procedure or the LOD related complications such as theoretical risk of premature ovarian failure or the risk of adhesion formation potentially interfering with fertility. Although the available data in the literature is limited, there was no concrete evidence of a diminished ovarian reserve or premature ovarian failure due to LOD in women with PCOS. Most of the changes in the ovarian reserve markers observed after LOD could be interpreted as normalization of ovarian function rather than a reduction of ovarian reserve (6). Adhesion formation related to pregnancy outcome is an important aspect of LOD. In the current practice, it is taken for granted that LOD causes abdomino-pelvic adhesions which results in further impairment in the reproductive performance of women with PCOS. This is based on a reportedly different amount and severity of adhesions seen in second look laparoscopy and leads to the obvious conclusion that surgery is not the choice which exposes women potentially to severe morbidity. This clinical approach should be challenged as, in these patients; good pregnancy outcomes are obtainable with safe, effective and inexpensive surgical technique that can last for prolonged period of time (7, 8). If further studies confirm the efficacy and safety of LOD in women with CC resistant PCOS, patients, who consent to gonadotrophins should no longer be sought based solely on the purported morbidity of surgical alternative. An increased risk for adhesion after LOD is well established, but excess morbidity related to the LOD on fertility is unclear. This review concentrates on the rate of postsurgical adhesions after LOD by searching available data, and its impact on reproductive outcome. An electronic search of MEDLINE and EMBASE for English-language and non-English-language articles from the date of the first LOD report which was published in the literature; 1984 to 2012 and a manual search of bibliographies from identified articles, were allowed to select all available studies (5, 9-22). Neither abstracts published in congress proceedings and scientific journals were included, nor animal studies were accepted. Sixteen human studies directly or indirectly addressed the issue of adhesion formation after LOD in women with PCOS were identified and included in this review. 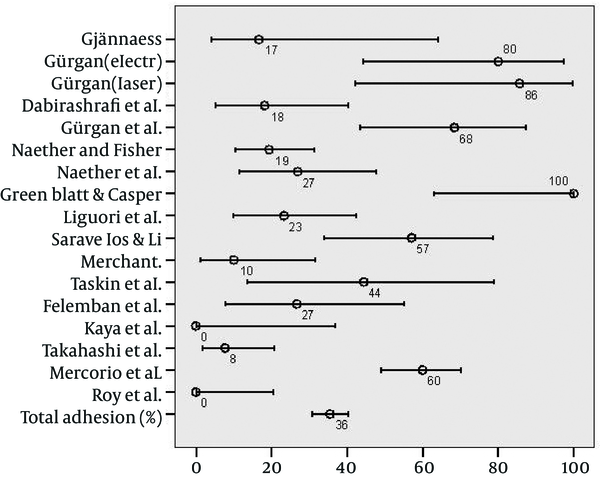 Since the “1991 Gurgan et al.” study ( 9 ) which used different energy modality in independent groups of subjects, and revealed the postoperative adhesion and pregnancy rates separately; the summary of the results are given separately in the Table 1 and, Figure 1 and 2. Adhesion rates were calculated by using the numerator figure; revealed as any adhesion observed during the second look operation divided by denominator figure; number of bilateral or unilateral LOD applied subjects undergone second look operation. The 95% confidence interval of the adhesion rates and total adhesion rate was calculated by MedCalc software (MedCalc Turkey, Version 11.1). The correlation between adhesion rates and pregnancy rates was assessed by using the correlation coefficient of Spearman’s Rho by using SPSS (Statistical Package for Social Sciences, version 13, Chicago, IL). Figure 1. Adhesion and pregnancy rates (%) after LOD in patients with CC resistant PCOS. Studies (both pregnancy and adhesion rates available included) were ordered according to the adhesion rates from 0% (Kaya et al. (19) and Roy et al. (22)) to 100% (Greenblatt and Casper (14 )). Only first author’s names and publication years were showed. The rate of postoperative adhesions has been reported to be between 0-100% and the reported rate of pregnancy after LOD was 35-87%. However, there is a lack of correlation between the adhesion rate and pregnancy rate among the studies, for example. where 100% adhesion rate was reported the pregnancy rate was 87.2% in the study published by Greenblatt and Casper (14). On the contrary, Kaya et al. reported a 35.3% pregnancy rate in their study without any postoperative adhesions (19). The average adhesion rate calculated from a total of 16 studies was 35.5% (95%CI: 30.8-40.4) with a mean pregnancy rate of 64.3% (95%CI: 58.2-70.7) (Table 1). 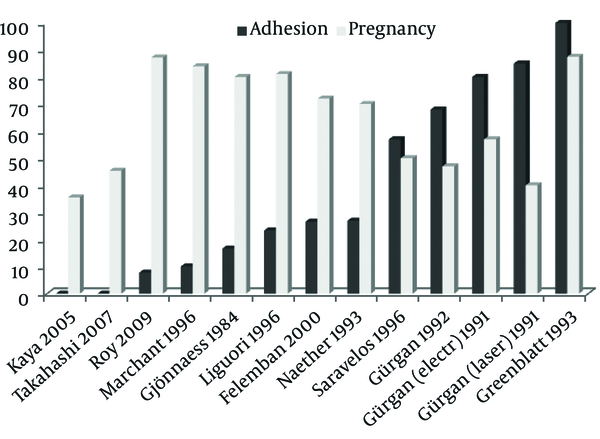 Figure 1 shows the rate of adhesion in comparison to the rate of pregnancy in 13 studies where both figures were available. There was no correlation between adhesion rates and pregnancy rates in either direction (Spearman's rho = 0.055, P = 0.858). The rate of adhesions and 95% confidence interval of those are shown in Figure 2. Since the sample size is too small for each study, the corresponding confidence intervals are wide and the rate of adhesion among the studies was distributed heterogeneously. The overall adhesion rate after LOD was calculated to be 35.5% (95%CI: 30.8-40.4). The revealed studies sequenced in chronological order from up to down in the y axis. Horizontal lines represent the mean adhesion percentage (round dots and beside figures) and 95% Confidence interval for each study. (in 1991 Gurgan et al. study (9), electrocautery (electr) or laser were used as the energy modality in separate groups). Using this terminology, the serious risks associated with laparoscopy can be described as “low” and the risk of death as “very low.” Therefore, the risk of postoperative adhesion and the theoretical risk of premature ovarian failure should be balanced by the achieved pregnancy rates. Limitations of this review consisted possible publication bias, as well as variation among cohort studies in sample size, duration of observation, selection of control groups, ascertainment of pregnancy after LOD, and adjustments for co-morbid conditions. The indication for second look laparoscopy in the different studies is unknown. The patients might represent cases that failed to get pregnant, and this would seriously impair the conclusion drawn. Studies with widely different numbers of patients are relatively given the same weight in the statistical analysis. For instance, an adhesion rate of 100% and a pregnancy rate of 88.5% that was reported by Greenblatt and Casper (14) were based on only 8 patients. Most of the studies in this review were not specifically designed to evaluate the postsurgical adhesion rates. The different amount of adhesion rates among the studies might be due to the heterogeneous nature of the trials. Even the definition of PCOS was changed by the time when reviewed articles were being published, such as 1990 NIH criteria, 2003 Rotterdam criteria (37, 38) were reported during this time period. Consequently, studies are so diverged in terms of studied population’s diagnostic criteria, purpose of the studies, instrumentation used, amount of energy and modality applied during the procedure, co-interventions to prevent adhesions, methods of second look, and time gap between the first operations and second look operation. Not all the patients in the included studies had been reevaluated by a second look operation. Therefore unavoidable selection bias could have occurred. Furthermore, in some studies the adhesion formation after LOD was assessed by second look laparoscopy but in others the assessment was performed during the cesarean section. In patients where the adhesion formation was assessed during the cesarean section as the second look procedure, the adhesion rate could have been underestimated, conversely, when it is evaluated only in women who have not been conceived in the follow-up period, the adhesion rate could have been overestimated. Most of the peri-adnexal adhesions after LOD were filmy, minimal, and found on the ovarian surface. Several adhesion preventive measures were described. Merchant has reported the efficacy of laparoscopic low-watt bipolar electrocoagulation of the ovaries in women with PCOS. At second-look laparoscopy or cesarean section in 20 women, fine string-like adhesions on the ovaries were found in two (10%) women (17). Thus, it is hypothesized that bipolar energy is safer than unipolar (monopolar) energy in terms of the risk of postoperative adhesions and the risk of overtreatment that can lead to ovarian failure. Restriction in the number of punctures (20), use of an insulated needle (39), activation the coagulating current only after the needle is inside the ovarian stroma (20), irrigation of the peritoneal cavity at the end of the procedure (12, 20-22), adhesion barriers like interceed (Gynecare Interceed®) (14, 16), adhesiolysis at the second look operation (30), using different energy modality (9) and bilateral or unilateral application of the procedure (10, 22) were recommended without robust and convincing evidence. Although some adhesion preventive measures like microlaparoscopy and decreased CO2 exposure on peritoneal microcirculation (18) or laparoscopic ovarian multi-needle intervention (19) were found to be effective, the number of subjects in each study is not enough for recommendation. Randomized controlled trials on each preventive measure with appropriate sample size are mandatory. On the other hand, medical treatment of infertile women with PCOS resistant to CC is not as innocent as is thought. Although, gonadotrophins bear no surgical risk, the probability of the risk of multiple pregnancy and OHSS still exist (23). Compliance of ovulation induction for women with PCOS is also arguable. The lack of randomized studies on this subject is not surprising. Indeed, based on the cost of treatment and injections being the only application route of therapy, gonadotrophins are expected to be used in a limited period of time. Chronic low dose protocol is the recommended way of application. Since the CC resistant women with PCOS are categorized in hyper-responder group, even modified gonadotrophin therapy could not completely solve the hyperresponse problem. Further understanding the pathophysiologic mechanism of anovulatory infertility in PCOS, may yield new medical treatment alternatives or different modifications in the application of current remedies. Finally, LOD was shown to be effective but safety of the procedure has not been thoroughly investigated. Although, this technique has some limitations, such as peri-adnexial adhesions and the risk of overtreatment related ovarian failure or atrophy, available data does not support those concerns requiring drawbacks. Implication for health policy/practice/research/medical education: The objective of the present study is to review the available literature to determine the rate of periadnexial adhesions following LOD, and to assess the effect of these adhesions on pregnancy rates. In this study, the incidence of peri-adnexial adhesions after LOD was found to be not associated with adverse reproductive outcome. Authors’ Contribution: I am the only author in preparation of the paper. Financial Disclosure: I have no conflict of interest by any means to disclose. Funding/Support: There is no sponsor to support this review.